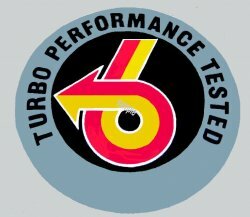 Buick Turbo Charged Logo - $10.00 : Bob Hoyts Classic Inspection Stickers, Add a Final Touch to your Restoration! This 1980's vintage sticker went on all Buick turbo charged cars. It has our patented "Peel and Stick" format to put on the inside of your car window. These were provided to the dealers by the zone office to be signed on the back and affixed to the inside 1/4 glass. Applicable to all SFI cars, intercooled or not. Very often the dealer would neglect to keep their supply of decals current so many vehicles never received these, so original stickers are very rare.